Attributions in the world of antiques and collecting change frequently, and across the board too, from porcelain to furniture to glass. This is particularly the case with ‘new markets’, like mid-century modern Italian ceramics and postwar Czech glass design. A new source will be unearthed, such as a catalogue or forgotten book, or a piece will be discovered with a correct, original label. On rare occasions, the designer or maker themselves surfaces to set the story straight. 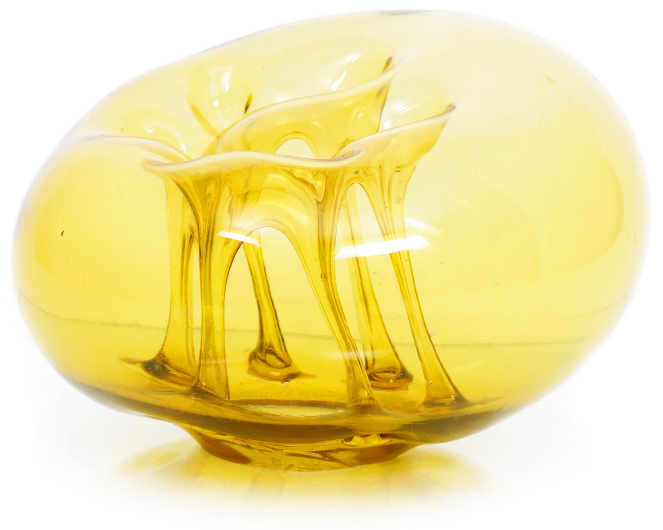 The sculptural design shown here, in olive green and yellow, is usually attributed to the talented Czech designer Pavel Hlava. 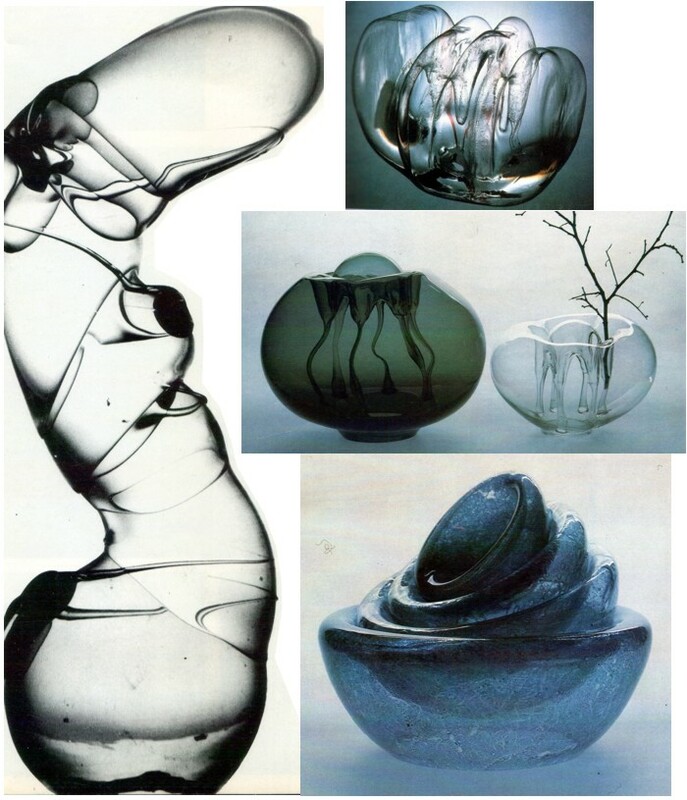 This is mainly due to the fact that he produced some blown glass during the 1970s & 80s with internal structures vaguely similar to these. It’s also because, along with Frantisek Vizner, he’s a well-known ‘big name’ and many are keen to raise the profile – and value – of their piece by attributing it to him. 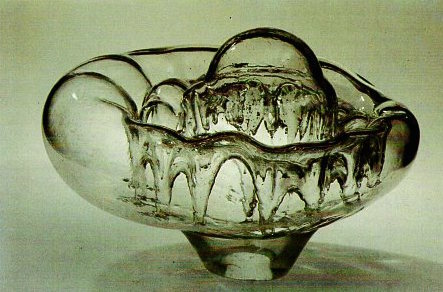 I never believed this attribution, as the glass is thicker than most of Hlava’s work, the machined base is different, the actual technique isn’t one used by Hlava, and the colours are completely wrong. I’ve been tracking these oddities for some years now after encountering the first one in the Graham Cooley Collection over a decade ago. 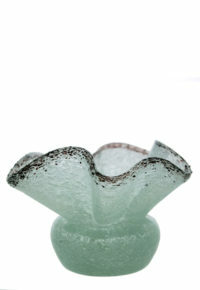 I then spotted another in the collection of a leading British glass dealer. More recently, at an Antiques Roadshow at Bowood House, a couple brought one along to my table. Apart from those and the one I own (the green one here), I have only seen one other example, in a closed antiques shop in Vienna. I think that makes them pretty rare! I’ve asked around and nobody knew for sure who designed or made them. 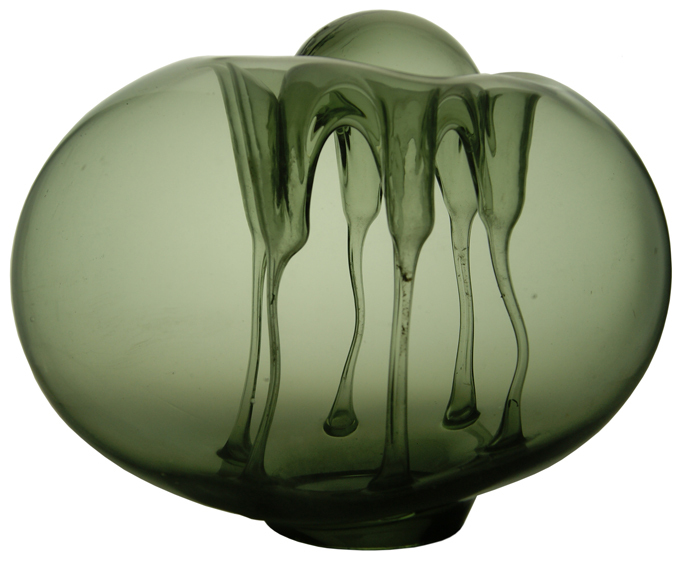 So I did a little research of my own and, until this week, I thought that they may possibly have been made by a Polish studio glass pioneer called Henryk Albin Tomaszewski (1906-93). I came across his work first at an exhibition in Warsaw’s Galerie Zapiecek (1972-2014) on a weekend break in 2004, and bought a piece and a book on him and his work. 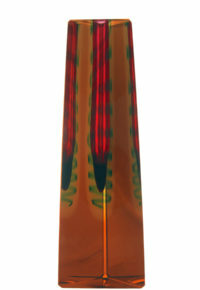 The 1950s-70s piece shown in the book (above) looked very similar, and it was backed up by numerous other works with similar internal funnels and tubes. 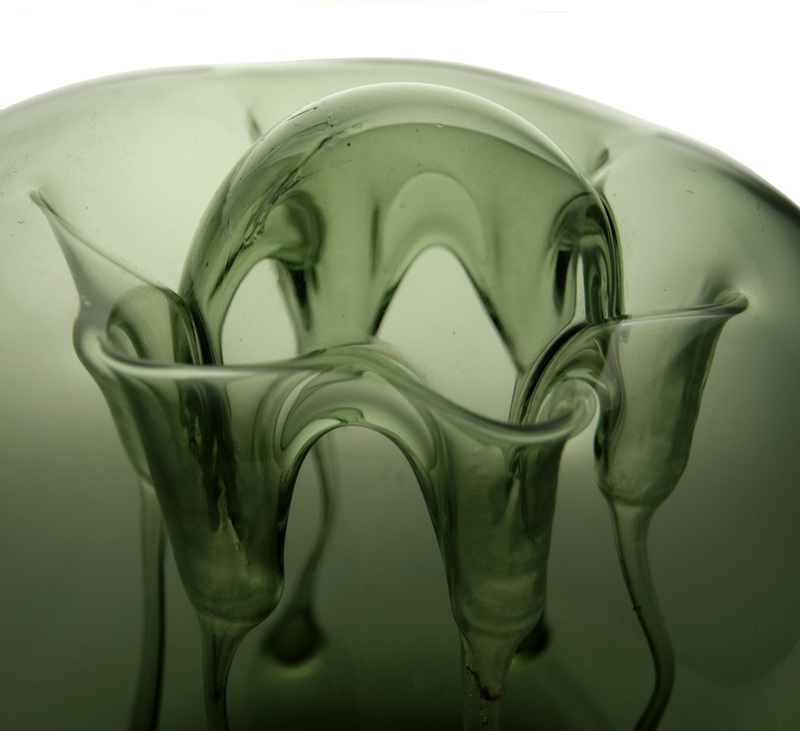 But I couldn’t work out why these mystery pieces seemed to be serially produced, and nearly all of Tomaszewski’s wild creations in glass were unique, with differing forms and sizes. Could his designs have been ‘watered down’ for serial production? Showing the power of the internet, I know now that my ‘lookie-likie’ detective work was incorrect. Dejan Vorgic, a Serbian art historian currently working at the National Museum in Zrenjanin, contacted me via glassmessages.com to explain he had firmly identified both the design and the designer. The design is called ‘Ikebana’, after the Japanese art of flower arranging, and the designer is Dragan Drobnjak, a name currently largely unknown outside Serbia. Vorgic told me that Drobnjak was born in 1941 in Prokuplje, Yugoslavia. He graduated from the Academy of Applied Arts in Belgrade in 1966, and gained a master’s degree in 1981. 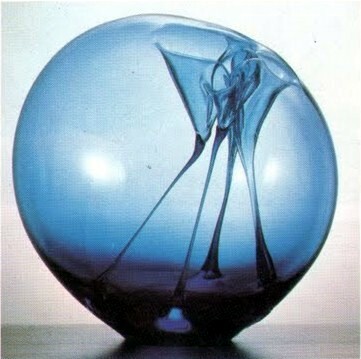 He was the first sculptor in Serbia to graduate using glass as a medium. 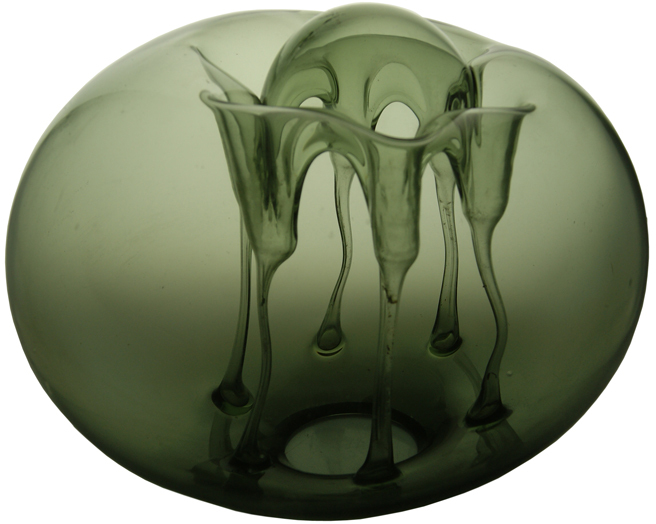 From 1969-91, he was a designer at the 9.October glass factory in Prokuplje, and his work was included in over 100 exhibitions in Yugoslavia and abroad, with 30 solo exhibitions. Key exhibitions included ‘Yugoslav Applied Arts’ in Paris in 1969 and ‘Applied Arts & Design in Serbia’ in New York in 1982. He travelled widely too, taking part in the important International Glassmaking Symposia in Novy Bor in 1982 and 1986, and attending similar symposia in Paracin (Serbia), Rouen (France), and Gus-Khrustalny (Russia). 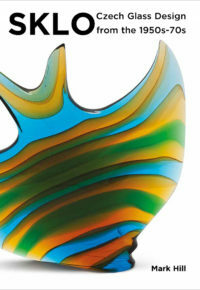 He has now stopped working with glass, but continues to produce bronze sculptures. Drobnjak’s ‘Ikebana’ design was devised around 1975-76 and put into production at 9.October in Prokuplje a little later in two sizes – pattern number 605 at 12in (30cm) high, and pattern number 606 at 8in (20cm) high. 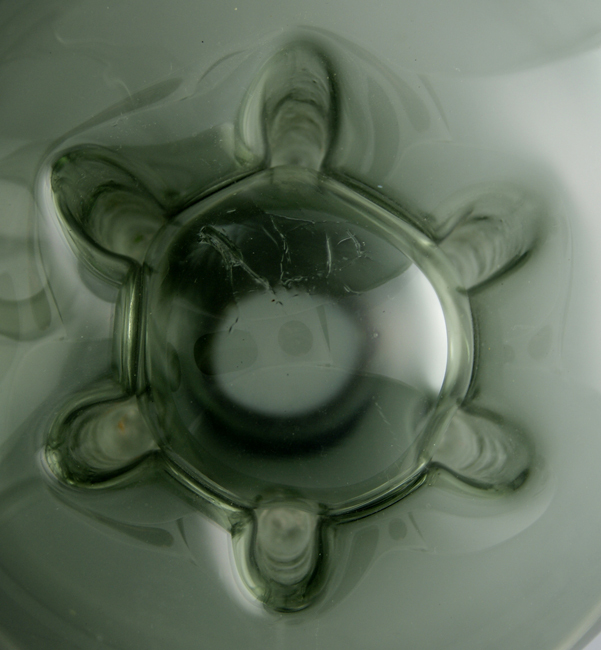 It had a dual function – to hold flowers, or act as a lampshade. 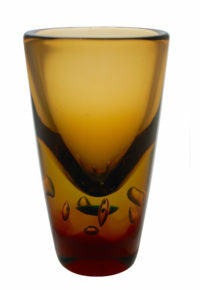 Colours comprised colourless, ‘green-smoke’, and bright amber, with examples in other finishes or colours being made for special exhibitions. Vorgic also kindly forwarded me a scan of a page from a Prokuplje catalogue from 1986 (below), showing that ‘Ikebana’ was still in production at least a decade after it was designed. Whether he was inspired by Tomaszewski’s pioneering work or not is unknown. The most important thing is that the mystery is now solved! I am indebted to Dejan Vorgic for the information given and scans shown here. 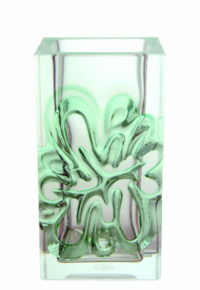 This entry was posted in Blog, Collecting, Czech Glass, Glass, Other Subjects. Bookmark the permalink.